"When Ukpik returned to camp, a fire had been lit, moss had been gathered to keep the fire going, water was being boiled, and food had been collected and gathered at the fire for breakfast. Ukpik placed her bucket of water by the fire. She set her puppy down as she sat beside her anaana, her mother, to eat her breakfast." 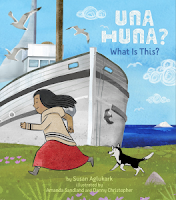 In this first book in a new series of six books, Susan Aglukark sets out to tell the stories of past generations of her family and her people. She feels it is very important to hear and share the stories told by her grandparents and great-grandparents about living a traditional life in the Arctic. 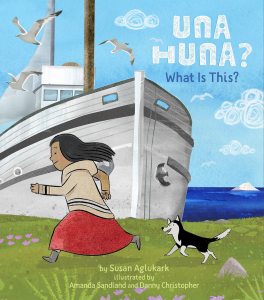 Through Ukpik, young readers will learn what it was like to grow up in the 1800s, and how the arrival of other cultures impacted the Inuit way of life. Early one morning Ukpik and her new, unnamed puppy are roaming near the sea when she sees a ship approaching. With great excitement, she rouses her father. Her father is happy to see it is a captain with whom he trades. As part of the trade, her father brings utensils (wooden forks, spoons and knives) to the community. Ukpik is intrigued. She ponders what they might be used for, comes up with an idea. Her father is pleased with her explanation, and asks her to share her ideas with the children of the community. Some of her friends wonder why such a change away from traditional objects is necessary. Their comments send Ukpik on a mission to find out more. A chat with her grandmother leads to thinking about times past and the changes that have already been seen in her lifetime ... some have been good and made things easier. Anaanatsiaq offers a bit of advice about the changes that challenge Ukpik's thinking. "That is our challenge, Ukpik, to understand what is in that other world a little bit at a time. Even if our world will not stay the same, our camp and our family will always be here to learn about these new things together." A glossary for the cultural language shared is useful, and the detailed illustrations give context to the historical time and setting.